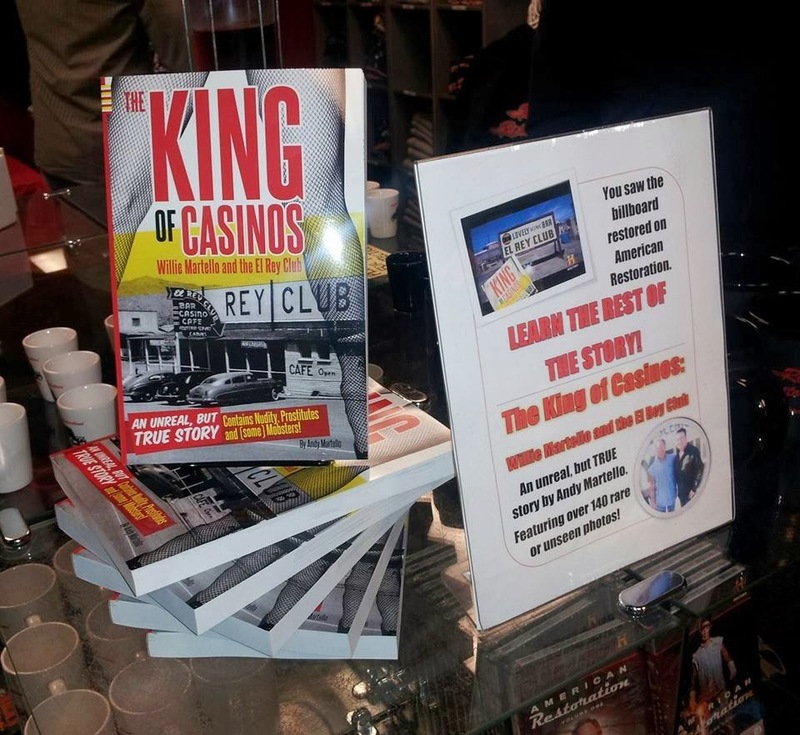 A FIVE-STAR Review for The King of Casinos from Readers' Favorite! "I couldn't put the book down." 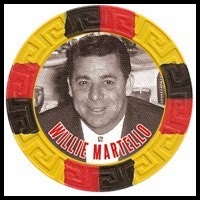 "The King of Casinos had me laughing out loud in places. Andy Martello has a real storyteller’s gift, a way with words that makes a reader want to be there in the thick of his story. The photographs were a fantastic addition to the book, priceless, and helping to tell the real story of the club. I couldn’t put the book down and I guarantee that anybody who picks up this book will feel the same. Once you start, you won’t want to stop until the very end. Great book, a fantastic piece of history brought to life." Reaaders' Favorite Book Awards and the Mob Museum! I have two big pieces of happy news to report! The King of Casinos has just been listed as a FINALIST for a coveted Readers' Favorite Book Award. This is a HUGE honor. Established authors, big name publishing houses, and world renowned books compete in this contest and to be named a finalist is simply unheard of for a first-time author. Aside from a piece of their $10,000 in cash prizes, if I win my category, I COULD be selected to be presented before the folks at Wind Dancer Films, giving the book a legitimate shot at becoming a movie. Send lots of good mojo and well-wishes. They announce the winners on September 1. I am also very happy to announce that you can now find The King of Casinos on the shelves of the world famous MOB MUSEUM in Las Vegas. I'll be speaking to their members in August and having the book there in advance of the appearance is very important. If the book sells as well there as it does at the Neon Museum, I should have some good movement for my little book. 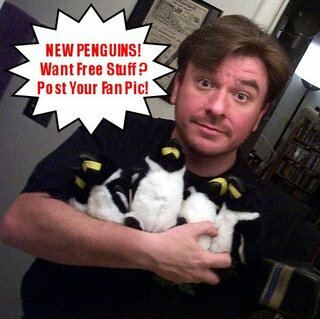 Get Your King of Casinos Collectable Goodies WHILE SUPPLIES LAST! Books come signed with a free bookmark. Drop me a line at andy@andymartello.com today! The King of Casinos Places at Hollywood Book Festival! The honors for this little book continue! 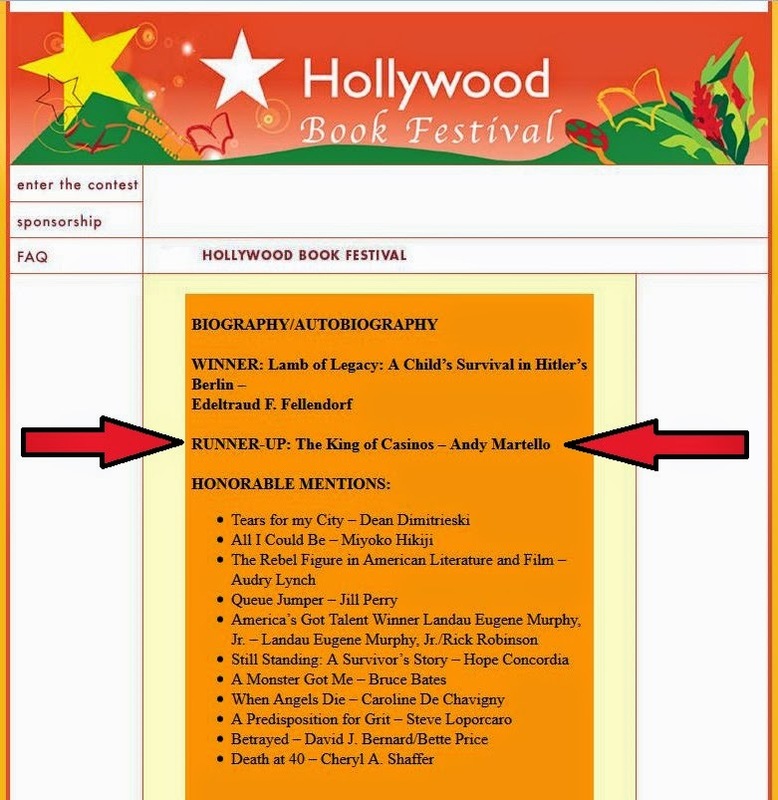 I am very proud to announce The King of Casinos was the RUNNER-UP in the biography category at the prestigious Hollywood Book Festival. This is the third award for my first book and I couldn't be more proud. I am humbled that is is receiving such recognition from so many reputable places. It may not be on the bestsellers list, but it is making waves everywhere it goes. One day, it will be a major motion picture or perhaps a TV show. 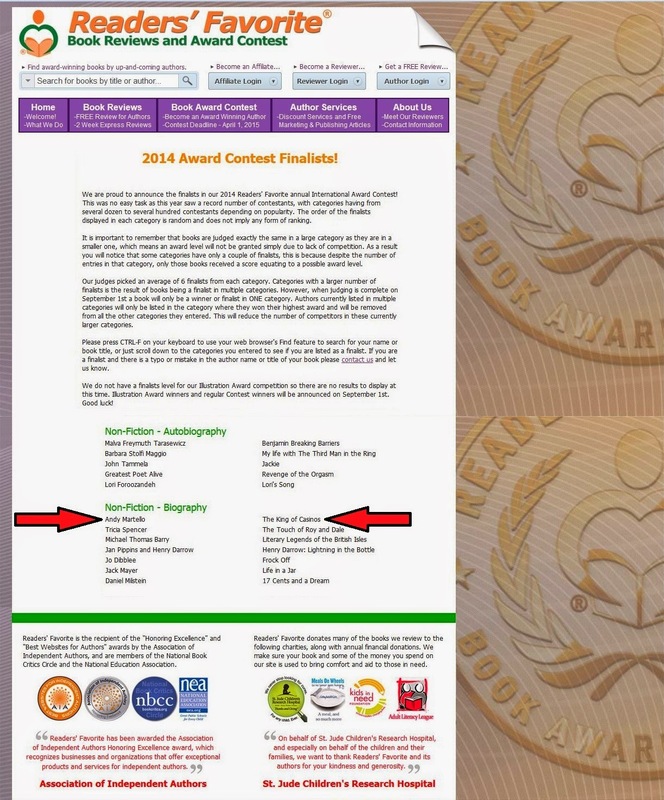 Placing in the Hollywood Book Festival is a good start towards that goal. is out NOW. Get your copy at Amazon today! There has been a lot of excitement going on here in Andy Land. 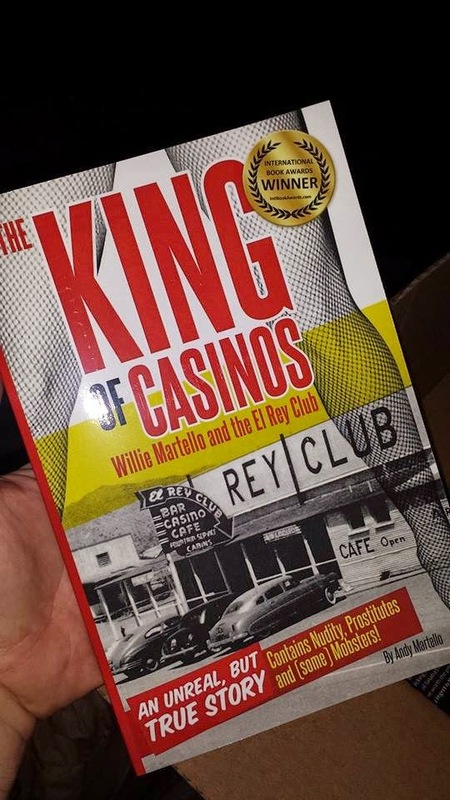 First off, in case I forgot to mention this, The King of Casinos was the runner-up (2nd place) in the 2014 Beach Book Festival, held in Manhattan. This is another prestigious honor for this first-time author and I couldn't be more proud of my little book. 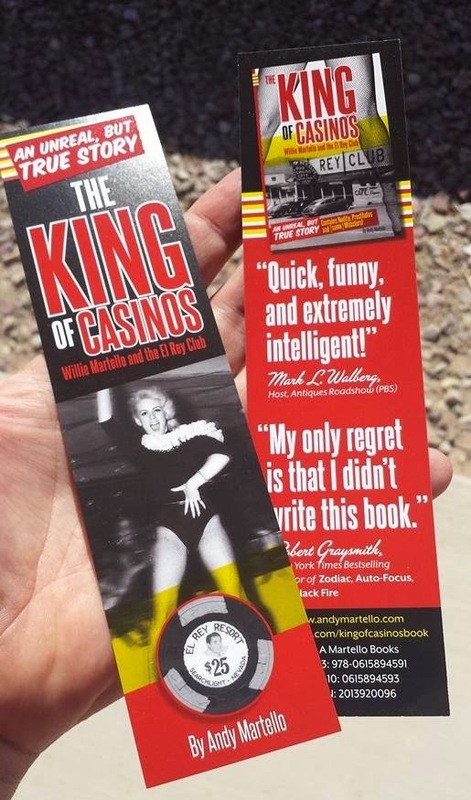 I am very proud to announce that the first revised edition of The King of Casinos will be available for purchase July 4, 2014, six months after the initial release of the book. This new edition will have a few minor revisions, a few new facts, and a few new photos for you. Mostly, it will be as rid of those pesky typos as I can get it. One big addition to this book will be the new cover, which proudly features the international Book Awards emblem. I don't like to brag...oh, wait! In this case I do. lol! This will be the version that ends up being submitted to reviewers, used for the e-book and audio book, and will likely be the last version you'll see unless I do a special collector's edition on it's anniversary. Lastly, I'd like to update the list of places where you can find the book. There are presently a handful of stores carrying the book with more to come!